After two years on the run, mob boss Don Cagliostro discovers his young wife, Maria--seeking escape from a life of organized crime--has been hiding in a nunnery in northern Europe. What the don doesn't know is that his right-hand man, Sullivan, who's been tasked with bringing the girl back home, is actually an undercover FBI agent seeking out Maria as a star witness in his case against the family. A simple-enough task . . . until info on Maria's whereabouts leaks. When mobsters, mercenaries, and hit men converge on the convent in the hopes of collecting a reward for bringing Maria to the don, the holy ground becomes a battleground! 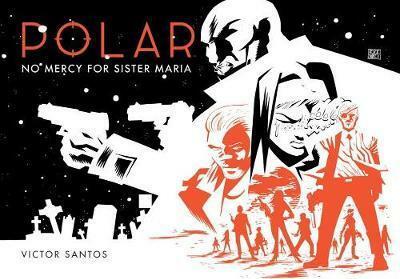 Victor Santos (Black Market, Sleepy Hollow) closes out his silent web-comic trilogy Polar with this third action-packed season! "A visual tour de force. With Polar, Victor Santos takes his seat at the table of the great graphic storytellers." Victor Santos, born in Valencia, began his career in 1998 by contributing to fanzines and local papers. His first professional work was 'Gaijin', published from 2000 by 7 Monos, Dude Comics and Dolmen Editorial. He also took on the heroic fantasy series 'Los Reyes Elfos', and an anthology of short stories called 'La Doncella y los Lobos'. Santos has cooperated on the 'Pulp Heroes' saga at Astiberri, did the superhero comic 'Protector' (Dolmen), a juvenile comic called 'Aventuras en el Mundo Jung' (Aleta Ediciones), and fantasy titles like 'Faeric Gangs' (Astiberri) and 'Lone in Heaven' (Aleta). For the French publisher Soleil, he created the series 'Young Ronin', for which he does script, art and colors. The author lives in Bilbao, Vizcaya, Spain.